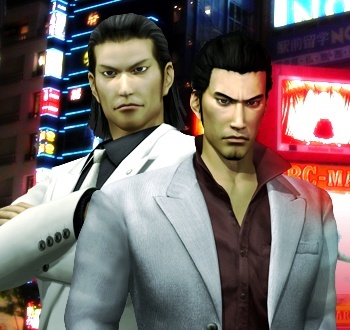 The main character of Grand Theft Auto kill innocents and push drugs, but Yakuza protagonist Kazuma Kiryu protects shopkeepers and babysits a little girl. Why? As Pat Miller writes in Issue 228 of The Escapist, at first glance you might be forgiven for assuming Yakuza was your standard Grand Theft Auto clone - it deals with take-no-crap tough guys on the other side of the law - but when you delve into it, protagonist Kazuma Kiryu is not quite cut from the same cloth as his Western counterparts. C.J. robs a casino, but Kazuma protects a shopkeeper from rival gangsters. Tommy Vercetti takes over a cocaine ring, while Kazuma takes a young girl named Haruka under his wing. In real life, the Yakuza are as ruthless and deadly as they come - so why do the games show a gangster that's positively cuddly by Western standards? For much of the Yakuza's history, their outcast origin story resembled a Japanese version of Robin Hood. Gang members were officially criminals, but they also served the public in ways that national institutions of the time didn't. Perhaps the most notable example is Shimizu Jirocho, a rice-farmer-turned-gambler who lived in Shizuoka during the latter part of the Edo period and was held in high esteem for providing order and protection from gang conflict, as well as defense from the oppressive samurai and police. After the Meiji Restoration, Jirocho became a police officer in charge of a local harbor and developed his under-the-table business with one hand while opening up an English language school and even a penitentiary with the other. To read more about the cultural image of the Yakuza in Japan - and why Kazuma Kiryu could never have been a cop - read "Playing the Hand You're Dealt" by Pat Miller in Issue 228 of The Escapist.